Its strange that “communication” is the topic that comes up in EVERYthing that I’m reading, and working with . so a lot of talking… strangely there was no swap of any details, just a nice talk and enjoyable… it was like all the stuff I’d been reading all week, and heard in church came together as a practical way of doing what I wanted but without the pressure of it all… so yeah, I do believe that God puts us in the right places at the right times. The Business – Getting there slowly. I always knew that there was a lot of accounting, and management of stuff but not really how often you need to do it. I can see how and why there are so many different software products to do things but i’ve not found one in my budget that I can use and do what I need. Its more a scan everything in and save it on computer with a spreadsheet of everything thats happening. Even then it seems a lot of work. I’ve been going to some “Networking meetings” which I’m learning is not to actually sell your product or service but more to get to know people and possably help others more than yourself but its all new to me which is kind of exciting while at the same time scary but I’m learning and feel my confidence is getting better and in turn think that I mix better with people. I’m discovering through the meetings that there is a lot more opertunities to meet with people althou I’ve not quite got the rhythem of how to get my business across. It is quite enlightening to watch and listen to how others are mixing, and working with others. Simple things seem to make the most impact – shame I’ve not worked out how to actually convert my words to that way yet… but i’ll get there. I love that I’ve such variety in life, and not just working or one thing. My weekly mix of things include of course: work, but then there is the trampolining, dance, gym/swimming, the games, occasional TV, Cinema, Hanging out – having drinks, cooking foods, chatting or even being online and chatting / playing / working from there too. Recently its been more on the side of trying to make a business work, and it takes a lot to know whats happening and what is to be done. I’m enjoying it but not so much the constant paper works – even when its not on paper. 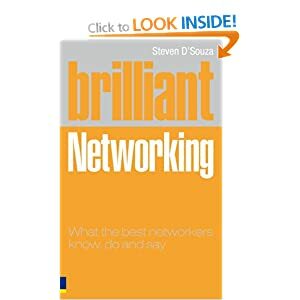 I’ve been reading a book named Brilliant Networking – to look at it from the outside, I’d have probably dismissed it – It is a bright flouresent orange with text on it – Not nice for the eyes however this is the worst part. I’m starting to understand that networking not as in IT but in relationship with people is a lot bigger than first thought. I thought it was about basically trying to sell your business to others, and partially that is still true but its a very small part of the whole idea. Its more a “help one another get the help needed” and build friendships, and through the friendships a way to talk openly on what your wanting, and what you can do. Sometimes its not what you can do directly but maybe introduce someone else to one another. An example, in the book was a dating site where the matchmaker gets the info from two people and then introduces them to one another and stepping back. In my sense of it all, it is not necessarily something that you get from it, but people usually do remember those that helped them and refer others to them… another saying “Give lots, Get lots” but sometimes nothing comes from it. Many ideas which I think I should have realised such as replying in forums, or newsletters or making better use of my blog and twitter. All things I knew, yet have let pass me by before now. Anyhow, I’m working through the book and enjoying it. Took it to my trip to london, its been suprising how easy it is to find time to read, especially in tranport areas – waiting for things or travelling on them – sitting or standing back and reading. I thought it would be difficult to read with all the moving but seems easy enough and really does pass the time. I’ve been finding a lot of my old diary notes of many years ago – Some from school times, others from uni and realise a lot has changed in Life, although I look back and see that I never really had any particular target in life, I expected that You grow, you get a job, then a wife, and then a family and the circle is complete. Well, thats not really happened in life. I’ve got the Job part down, but thats been there for around 8 years now and no other to call wife, or partner even so no chance of family. I look back and have found that I’ve not had an ambition more than to one day run my own business – This year that started. Then, when I thought of this, I didn’t know what I wanted to do a business in – just to run one and hopefully help people in a way that could help me keep doing it. I found my old “Year book for 1995 school leavers” and read through it. I found my entry for “Fantastic Fact” – I put down I was a Christian, and still when I look back I wonder how I was so bold to put it down. Initially when I put it down I was told I couldn’t have that as its embarassing and the people that took them to be made up scribbled it out. I got around it as was helping to type them up into the computer and added and saved it then. I’m still pleased that I chose too – it felt right then and still 15+ years on it still feels right as it is a part of whom I am. In life, I seemed to take an approach of What can I do well, I’ll keep doing that. In Education, I could use a computer well at school whereas most other subjects I didn’t do well at so I went into computers – how to build, how to make programs for them, and fix issues people had in them. I’ve always just stuck to it. Finished school, did a BTEC in IT at college, and a degree in IT at Uni and now work in it… but I’m not sure its what I always want to do. I’ve spoken to a lot of people recently and discovered that many of them, have followed much the same plan as me but in different subjects. Now they work in something totally unrelated but love the work they do. It got me thinking – why have I limited myself to one job category when I could work anywhere. I can recall a time where I wanted to “Save the environment” or “save animals” with projects working with GreenPeace or RSPCA… Nowadays its more, send a little of my money to them or promoting recycling through work and home. I don’t seem to have the same passion that helped me along before and I am in search to refind it. I do enjoy work most of the time, but think there is change due… be that in my business taking off and allowing me to work just the one job or moving somewhere else and starting afresh. There are lots of things I could apply my knowledge too that I have from my educations and the friendships I’ve made over the time. I am starting to realise through work that “no” doesn’t always mean “No” but often means “I don’t understand what your asking, can you ask me another way?” – This I think is to do with the networking things I’ve been researching to do with my business. When I was a lot younger (in school) I was told I had an active imagination – this helped me through a lot of things, be it problem solving by seeing the multiple posabilities or just dreaming into another place to get through time. I use my imagination a lot now, and can often have lucid dreaming which can allow you to do whatever your imagination allows you too. I am seeing that I have many opertunities in life now, since my trip away to london. Strange that it took me being somewhere totally different to see that where I am I can do so much. I’ve been afraid to try some things, a lack of confidence of “what if” rejections but if I never try it then I am just rejecting myself automatically so I will try and see how it goes – Only better can it be, as if not done I was rejected anyhow. Saturday has been a generally nice day, didn’t feel too well in the morning but thankfully it was gone by around 2pm. I headed over to the Museum of Science, I liked it but think I enjoyed the History one yesterday more. It was busy, but that is expected on a weekend and in school holiday, but wasn’t so busy that you couldn’t see anything. I liked looking through the past of computers and time, one item that was a slanted ball and table to count seconds caught my eye – it was said to be quite unreliable but still I liked it. After the museum, I wandered around for a while and looked for something to eat. I was tempted to try sushi as never done before but couldn’t find anywhere that did a sample seleciton at a price I would pay… I looked for under £15 and the only places that had anything on offer close were empty while other restaurants were full – I didn’t see it as a good sign so ate somewhere else. On the way back, a guy decided that the busy underground train was a good place to try some busking, and he had a large portable speaker and microphone of which he sang several songs very badly, and his actions – well… The less said the better to be honest. But he made myself and several laugh – probably not the intended reaction but it was a reaction. I wasn’t out late on saturday night, back in by 10pm which around London is still quite early. I plan to be at church in the morning – assuming I can find it, then its getting ready to head back up north to Teesside again. Its been a good break from the norm, don’t know if I could live in the City and Work, but overall its a nice place in my opinion… then again everything unless stated here is my opinion… just to make that seen. Anyhow bed time now, its 2:49am and really I should be asleep by now but instead almost going to sleep on laptop. Friday: Late start, but more exploration… I went to visit the museums – I went to the National History museum, I think I went as a child but don’t remember – this time I think I will – it was quite awesome and totally free to enter and wander. I liked looking at some of the dinosaurs or what is thought to be dinasaurs and the many other suspected creatures of the past. How anyone can predict something took millions of years as a fact of reasoning when I can’t see how the process to measure that is, then I don’t know – I find it strange when people say that the earth is millions of years old… Strangely enough, in another part of the museum it stated that the sun, and planets only came into existance less than 10,000 years ago – so which is it? It can’t be both can it – I say neither is correct and i’d say were probably never going to be able to know. Anyhow, History museum, Nice place – very busy. History and predictions of the future. I learned of Volcano’s; I’d known about it, but little things stuck out that I was unaware of. Makes me want to watch more of discovery channel by the emenses of information about the nature around us. To see… Bugs, birds, dinasaurs, use of energy, fossil fuels, future plans of life, sea life, lots of people, and many more that I saw but probably didn’t quite see totally. I’d say go if your in London, nice to see so much and it was free too. Met with another friend after they finished work, We both managed to get to station at same ish time even though we were to meet 20 minutes later. She spotted me, I only realised when she was closer… We went to Nandos – very nice chicken wrap for me – quite filling. Afterwards more wandering, and chatting – My feet/legs are saw from walking but feel fine at the same time. I think this trip is started to help me realise some more fitness is needed but its nice to wander and explore. Headed back near 10pm, I was back at flat by 25past, managed to get to stations just as transport arrived. Traffic doesn’t stay stopped for long in London but if you miss the currect connection there is usually another in a few minutes time. I do think the transport system is quite amazing in London – their website for directions is great giving you estimated times and links between walking, trains, subway, and buses and offers alternative routes. The whole idea of it, its so complex yet simple to use. I really like it – the design and initial setup must have taken ages but now, very easy to use in my opinion and the “Oyster Cards” that allow transport so easily without cash and tickets mixed up. I plan to go to the science museum Saturday, and explore a little more and just relax. The plan of relax, take some time out and read a bit aswell as visit the city has devloped into more and I like that. I’ve often planned stuff in the past but when its put to action nothing is quite right. This time, with little to no planning things are running quite excellent. My plan was to come to London for a break, I hadn’t really planned anything just messaged a few friends I hoped to meet up with. The entire plan was get to London, Explore, Meet friends, Head home. I’ve got what feels like a lot done in the few days I’ve been and am here. Arrived mid mad rush at 6pm Wednesday – the underground reminded me of school buses where its all cram in as much as possable, even thou another is coming in around 7 mins. A good journey down on the train and doing so much walking wandering. Chinese from china town, quite late on. Seemed late, but probably really wasn’t 9pm ish I think. It seemed in a rush, everything to eat up quickly – it didn’t work.. we just took out time and chatted while eating slowly through the mountains of food produced to us. I got shown around westminister twice, once with dad but a lot was closed so next day went and saw more. There is so many statues and books in places, and formalities – it was a lot more interesting than I thought it would be and everything so huge…. High ceilings with great shapes and designs and records of who did what or why. It felt a lot like being in a movie with everything large around you in a formal pre now layout with loads of books and statues. Thursday was exploration day, after westminister I wandered – got the underground to a central point and then wandered through the streets – lots of shops, pubs, chill out places and most of all lots of people almost everywhere… but gorgeous weather – no idea the temperature but was warm to me. I was meeting a friend at 5ish, ended up closer to 6ish but it didn’t matter as I was chilling out on a large grass area, looking up into the bright sun light and seeing the London Eye wheel. I don’t want to go up in it – looked quite boring, maybe its interesting – probably not. Wandering through the streets and exploring and chatting. We went down the southbank river walk area and saw many street acts and entertainments – it was nice to see so much, we got food eventually after finding somewhere nice, and it was really nice. Wednesday, after a quite busy day of getting things sorted, I got dropped off at Darlington station to go to london. Train on time, I’ve not really travelled much by train but so far seems fine, if a little bumpy which makes typing interesting. So, a mid week to weekend trip to London. The plan – Meet with Dad, and see some friends aswell as just have some space away from everything and everyone to be honest. Life seems to have got so busy, now with running my own business, aswell as normal work at the medical centre and just having so much on which is nice to have the variety but means I don’t feel I stop. My ticket was around £40 from darlington to london, I checked bus althou didn’t want to go that way and it would have costs nearer £30 to £35 one way so glad I chose the train way – also managed to get First class too, think its the time of day – 15.25 to 18.05 is apparently the times. Still first class train compared with bus travel – I think it was worth the extra £5 to £10 for the peace and leg room.